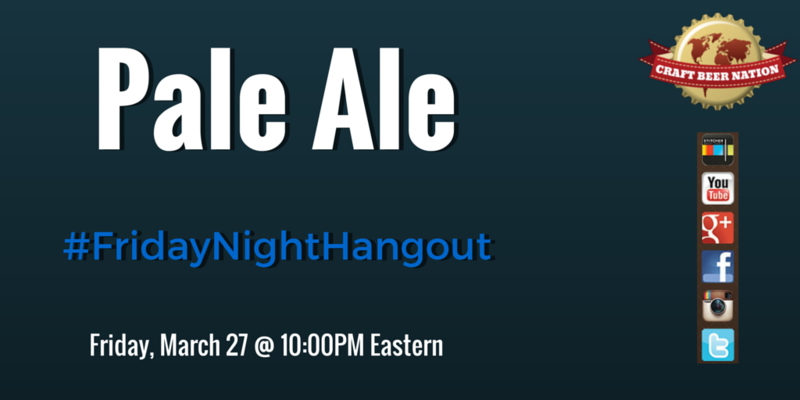 On Friday, March 27, 2015 Craft Beer Nation will be celebrating Friday Night Hangout Episode 151 with the Pale Ale and a slightly revamped FNH 2.0 formula. For the most part the show will be what it has been: drinking and discussing a different style of Craft Beer each week. However, we’ve decided to concentrate a bit more on providing useful and interesting content and less shenanigans. Going forward throughout the week we will be posting about that week’s FNH style leading up to our show on Friday evenings. We also want to hear from you. We want you to share your thoughts, pics, reviews on each week’s FNH beer style. We’re also very interested in hearing your feedback. What do you like or dislike about the show? Without us hearing from you we don’t know if we are delivering content you find interesting and useful. And if you have any suggestions for a segment please let us know. Also, very soon we will be giving you the chance to choose an upcoming FNH craft beer style. Bottom line: we want to know what you like or dislike about each week’s style. We want you to be involved and have your comments shared. So, we’ve had a blast finishing up 150 episodes and now we look forward to many more. Reminder: This week’s #FNHbeer is PALE ALE. So share with us your thoughts on the style.